Why some women owe Gov Palin an apology! While drinking my morning coffee today I was greeted by the most delightful example of women helping women courtesy of Stray Yellar Dawg. Hats off to Gov Palin for her leadership and courage. 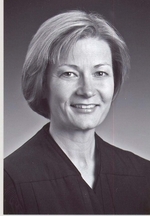 Yesterday, Gov Palin picked Anchorage Superior Court Judge Morgan Christen to become only the second female Supreme Court Judge in the history of the State of Alaska. But Judge Christen isn’t just any woman. She is a pro-choice and was even on the board of Planned Parenthood in the 1990s. The other finalist for the job was a more conservative male. The head of the Alaska Family Council — a Christian pro-family, anti-abortion group — on Wednesday sent an e-mail to thousands of people asking them to urge Palin to pick Smith, not Christen. The family council plea, from group president Jim Minnery, said Smith was “more conservative” and that Christen would be “another activist on the Court.” In an interview, Minnery said that was the “general consensus” but he had no specifics. What a bold move by Gov Palin. If the governor of Alaska were a man, would he, in this type of scenario have chosen a woman over a man? Especially if there was political fallout for doing so? You bet your sweet a*s NO WAY! This is why we must get women into positions of power. It is women that will promote women in politics, academia and corporate America. But my basking in the glory did not last long. The next thing I did was to read Violet’s wonderful blog piece this morning on what the antifeminists at Slate were up to and seeing the mock poster that was put together by Samantha Henig (if you have the stomach, keep scrolling down to Violet’s piece). Now I thought the misogyny and sexism aimed at SOS Clinton by the MSM during the primary was appalling. And, as many of you may recall, I spoke out about the fact that Howard Dean was totally silent on this sh*t show until May 31, 2008 – at which point it was a little too little, a little too late! But what happened to Gov Palin in the presidential election was equally appalling. Thing is, it wasn’t just the MSM. Many of the allegedly progressive women, like Samantha Henig, were front and center in this assault. Remember the proud Democratic woman wearing the t-shirt: “Palin a C-word”? Need I go on? I think back on how SOS Clinton handled herself. Once again, Hillary was the model we should all aspire to as a true feminist. Hillary was pushed, chided, cajoled and every other form in imagination “encouraged” to attack Sarah. She refused. Hillary’s MO was that she would happily point out differences in issues, but she would NOT, I repeat NOT, attack Sarah Palin personally. Now with the benefit of time, I hope that women who had so maliciously attacked Gov Palin will do a bit of self reflection. Was it appropriate to sexualize her and attack her in a misogynistic way? Who was the audience you were trying to please? I mean, c’mon – speak out against her on the issues – THAT is fair play. As our first female Secretary of State famously stated: “There is a special place in hell for women don’t support other women.” Well, there is even a more special place for women who are degrade other women and try to make them into sexual objects – and I bet it’s hot down there!